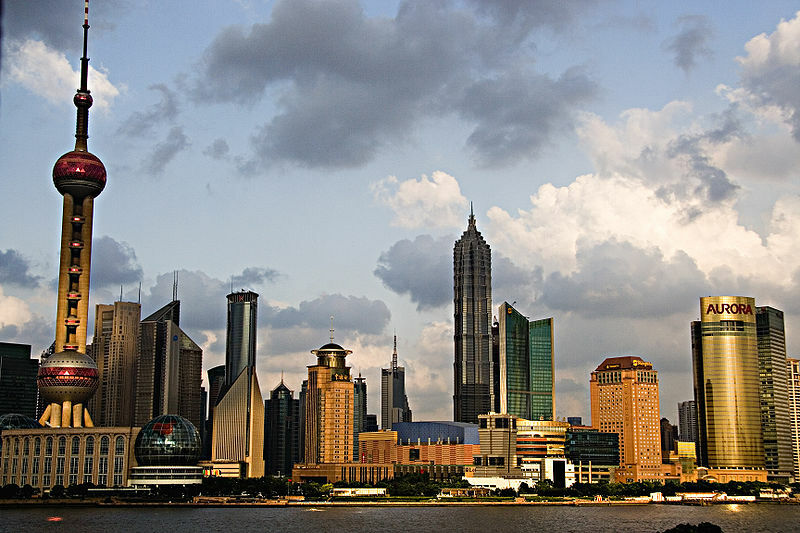 The port city of Shanghai is poised to become another major center of the global art world, possibly even displacing Beijing as China’s artistic capital. Since founding a biennial and art fair in 1996 and 1997, respectively, major institutions supporting the visual arts have sprung up or expanded. Despite the closure of studios and galleries at 696 Weihai Road in the spring of 2011, Shanghai’s gallery scene is flourishing, and the Chinese government is encouraging the development of a commercial art market in Shanghai. The State Council recently created a commercial-friendly and eventually tax and duty free zone in the city, allowing international auction house Christie’s to hold its first-ever sale on mainland China in September. Among the works included in the sale were Bicycle by Zeng Fanzhi, which sold for $1.5 million and Cai Guo-Qiang’s Homeland, which brought in $3.4 million. Shanghai view from Peace Hotel. Photo by Michel R. Creative Commons License via Wikimedia Commons. 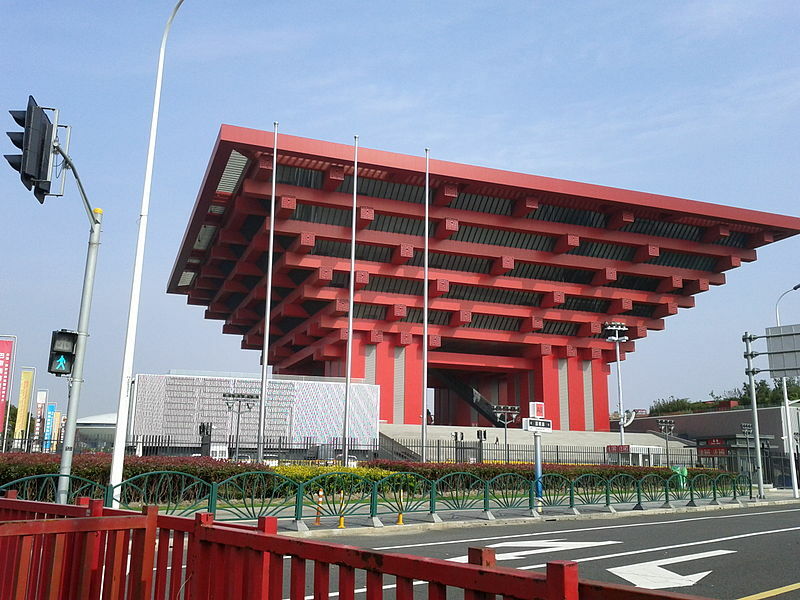 The national government is also investing in major public museums in Shanghai, announcing in late 2011 an initiative to open 16 new museums by 2015. The city, China’s most populous and its economic capital, now boasts an impressive number of modern and contemporary art museums, including the Museum of Contemporary Art (founded 2005). In addition, both the Power Station of Art and the China Art Museum (formerly the Shanghai Art Museum) opened in October of last year. The China Art Museum is huge in its size (nearly 1.8 million square feet, reportedly the biggest museum in Asia) and in the scope of its collection and exhibitions, garnering comparisons with the Metropolitan Museum of Art, New York. China Art Museum, Shanghai. Photo by DavidXiaoDaShan. Creative Commons License via Wikimedia Commons. But while the state is able to deploy such resources to construct and manage the institutions, the nature of the art they will house and exhibit has been called into question. Not only does the government target artists who make politically challenging statements or art works, but it also promotes what some would characterize as a sanitized version of Chinese cultural history. A current exhibition at the Power Station of Art, a retrospective covering the last 30 years of Chinese art (including works by Zeng Fanzhi, Yue Minjun, and Liu Ye), has been criticized for omitting the work of one of China’s best-known living artists, Ai Weiwei. Ai and other Chinese artists who openly criticize Communist Party policy in their works exhibit successfully abroad, however. An example is Zhang Huan, who according to the Benezit Dictionary of Artists explores “the communal fate of migrant workers; population control, including the one-child policy and abortion; and poverty in rural China.” A recent show of his work in Florence, Italy drew record crowds. Curators of the Armory Show in New York have recently announced that next year’s show will focus on contemporary Chinese art. In the meantime, scholars and connoisseurs of Asian art will no doubt be watching Shanghai’s rise, and how members of the art world work within the city’s commercial, political, and cultural climate. Kandice Rawlings is the Associate Editor of the Benezit Dictionary of Artists, now with new and revised articles on contemporary Asian artists. Each Benezit entry consists of a brief biography and overview of an artist’s work, and many entries also list exhibition histories, bibliography, and auction records, offering both general information for casual users and avenues for further research for students and scholars.